"I remember very well the old A.D. Williams Clinic and our sessions there. Tuition was $675 per semester, which is really something compared to what they have to go through now," he said. "I thought that one way I could help, in some small way, was to make a contribution back. It's great to see these students with intelligent minds going onward. When I look at the gift I made, I consider myself a small fish in a big pond really." Baber, a retired anesthesiologist in Newport News, Virginia, made a financial commitment in support of a new School of Medicine education building. The gift is divided between a $10,000 pledge and a $50,000 bequest. By structuring his gift in this manner, he is contributing critical cash to the campaign now as well as leaving a future gift of significant impact. 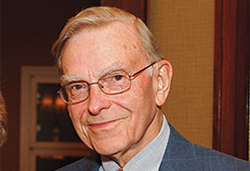 By including the medical school in his estate plans, Baber also joins the ranks of the MCV Society, whose members have provided future support to the MCV Campus through their planned gifts. In addition to charitable will bequests, such as Baber's, planned gifts include charitable remainder trusts, gift annuities and pooled income funds.